EW's top pick of the week: season finale of "Lost"
(Entertainment Weekly) -- More than a dozen TV series sign off for the summer this week -- or, in the case of "Prison Break," forever -- but none has as much riding on it as the final two hours of this mojo-recapturing season of "Lost." 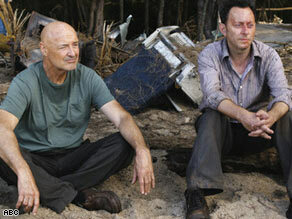 Locke (Terry O'Quinn, left) and Ben (Michael Emerson) ponder the future and the past on "Lost." Among the burning questions we hope -- nah, demand! -- are answered by the two-hour season finale (Wednesday, May 13, ABC, 9-11 p.m. ET): Will Jack (Matthew Fox) negate all of "Lost" history by exploding a hydrogen bomb on Quantum Leap Island? Will Jin (Daniel Dae Kim) and Sun (Yunjin Kim) reunite, even though they're in different decades? And will Sawyer (Josh Holloway) and Juliet's (Elizabeth Mitchell) happily-ever-after romance come to a bloody end? We'll also learn about a fabled event called "The Incident," and, according to rumors, may be formally introduced to the mysterious Jacob. "Prison Break" series finale (Friday, May 15, Fox, 8-10 p.m. ET): The series' four seasons defined "off the rails," but this fun ender does them justice with the surprise return of one of its most lovable former baddies. "Angels & Demons" (out Friday, May 15): Tom Hanks and director Ron Howard return in the sequel to "The Da Vinci Code" (though it's based on author Dan Brown's earlier novel). Code-cracking academic Robert Langdon (Hanks) and a scientist (Ayelet Zurer) scramble to stop an apparent plot by a secret society of scientists called the Illuminati from blowing up the Vatican. EW has a full preview here. Green Day, "21st Century Breakdown" (out Friday, May 15): They may be Grammy winning mid-thirtysomething multimillionaires now, but Green Day remain remarkably good at high-blast anthems that burrow directly into the pogo-ing, lizard-brain id. EW has a full review here. "Galaxy Quest: Deluxe Edition" (out Tuesday, May 12): On the eve of J.J. Abrams' "Star Trek" reboot, this cult riff on Gene Roddenberry's space saga gets a lavish and loving 10th-anniversary face-lift. Extras include a video of Sigourney Weaver rapping (no joke) and a few deleted scenes with "The Office's" Rainn Wilson as a pasty, nerdy alien. ''The Best of Star Trek: The Original Series" and "The Best of Star Trek: The Next Generation" (both out Tuesday, May 12): On the former, there are four goodies: Kirk falls for Joan Collins in the '30s; the first Romulan battle; Kirk and Spock battle on planet Vulcan; and ... Tribbles! Half of "TNG's" four-episode disc is devoted to the two-parter with the series' freakiest visual: Picard as a Borg. "Road Dogs," by Elmore Leonard (out Tuesday, May 12): The new book from the prolific crime novelist features some old friends from the author's previous works: Jack Foley ("Out of Sight"), Cunda Rey ("La Brava"), and Dawn Navarro ("Riding the Rap"). For pop culture picks for today click here, plus see what's new this week in movies, music, TV, and more.